TeraBlitz.com is releasing its first version of TeraBlitz Steam Header Custom Grid Gloss Pack v1 for free download. The custom grid steam header images replaces the default steam games library headers with TeraBlitz’s glossy and curved icon alternative. The Gloss Pack version 1 uses PNG compression and was designed to appear more like glass. Version 1 contains a huge collection of 445 unique Steam game headers using the default 460×215 custom grid size. Each steam header is designed with a curved border radius to simulate the design of a button. The PC Games and their brand names are copyright of their respective owners. 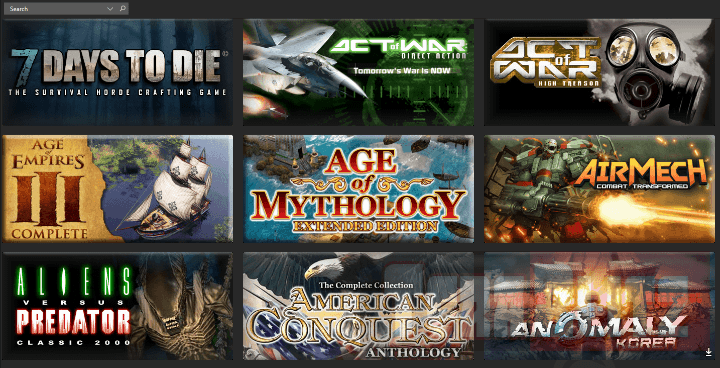 TeraBlitz does not own the rights to any of these games and serves only to provide enhanced gaming environment within the Steam Library interface through an alternative header design. To download, click on the desired image link to download separately or download the pack as a whole. TeraBlitz Steam Header Custom Grid Gloss Pack V1 by TeraBlitz is licensed under a Creative Commons Attribution-NonCommercial-NoDerivatives 4.0 International License. Based on a work at TeraBlitz.com. DISCLAIMER: The following data is posted for informational and archiving purposes only. By viewing this information, you release the author from any responsibility or liabilities. Use at your own risk. The images in TeraBlitz Steam Header Custom Grid Gloss Pack v1 may or may not work for your system. For any updates, additional requests or changes, please comment below.